Hillary Clinton’s long-time aide and campaign insider Huma Abedin may have inadvertently confirmed that Hillary Clinton’s mental and physical health are deteriorating. 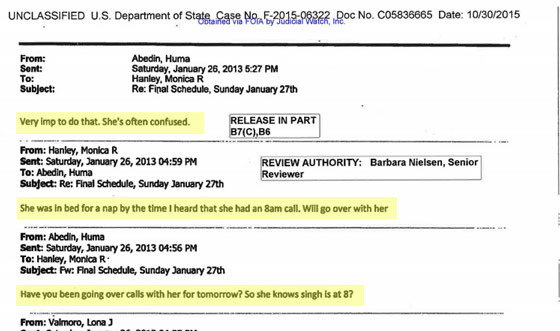 In a private email sent via Clinton’s unsecured server and released after a Freedom of Information request by Judicial Watch, Abedin exchanges emails with State Department aide Monica Hanley and notes that Hanley must go over material with Clinton because she is often confused. Abedin: Very imp to do that. She’s often confused. The emails also provide specific details of Clinton’s last day in office on January 31, 2013. Exact times and locations of all her appointments during the day are given. There’s the photograph of Secretary Clinton’s difficulty walking up some steps. Now inability to climb stairs does not necessarily disqualify a person for public office. However, neither she nor people with her apparently anticipated a problem. The people helping her seem to be preventing a fall. Did she simply trip? Or was it a seizure or a stroke? A man who stays close to her, who is reportedly not a Secret Service officer, was photographed carrying something in his hand that purportedly might have been an autoinjector of Valium. While we don’t have Mrs. Clinton’s medical records, it is widely stated that she experienced a fall that caused a concussion. Since then, she is sometimes seen wearing eyeglasses with prisms, as are used to correct double vision. Is Hillary Clinton unfit to serve? The following video report details other awkward Hillary moments. Hillary Clinton has not yet released her medical records.